North Carolina and Nevada—Esri Shirts Fit in Everywhere! 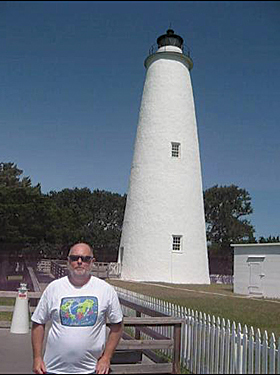 Steve Gochenaur, GISP, GIS analyst, Lancaster County GIS, Lancaster, Pennsylvania, is wearing his oldie-but-goodie Esri T-shirt at the lighthouse in Ocracoke, North Carolina. His family vacations on the Outer Banks every year. 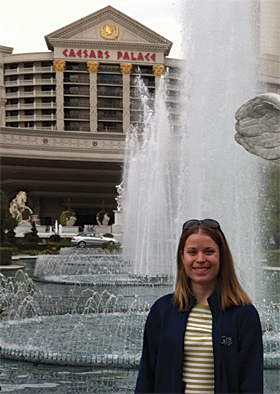 Kitty Hurley, GIS and all-hazards assessment coordinator, Hennepin County Emergency Management, Medina, Minnesota, poses with her GIS apparel in front of Caesars Palace, Las Vegas Strip, Las Vegas, Nevada. 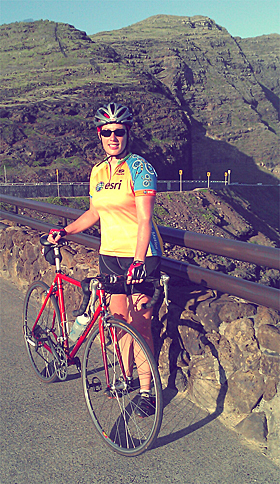 Christine Chaplin, GIS technician, US Army Corps of Engineers, is proud of her Esri bike jersey. This shot was taken at Makapuu Lookout on Oahu, Hawaii. 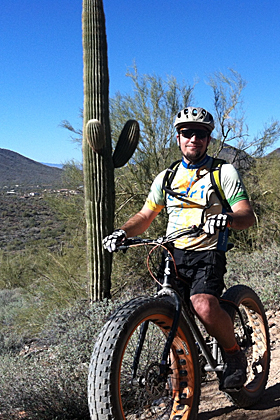 Garrett Topham, GIS specialist, City of Mesa, Arizona, models his fat bike next to a skinny cactus . . . and includes his Esri bike jersey, too.